MSU Chairperson of the Department of Chemical Technology in the Faculty of Science and Technology, Dr. Gift Mehlana has won the PhoAgro/Unesco/IU PC Green Chemistry Research award. The award was presented during the 8th IUPAC International Conference on Green Chemistry in Bangkok, Thailand. The PhosAgro/UNESCO/IUPAC project seeks to harness talents of young scientists for the advancement of the green chemistry and the use of fruits. The project set out to raise awareness among decision and policy makers, industrialists and the public at large of the vast opportunities green chemistry offers to meet pressing societal needs. The award included a grant to the tune of US $ 25 000 which Dr Mehlana will use to carry out research on the conversion of carbon dioxide to useful chemicals. The research is being done in collaboration with fellow renowned scientists based at Chalmers University of Technology in Sweden, University of Cape Town and the University of Johannesburg in South Africa. Dr Mehlana said he was excited about the award as it enhanced the image of the Midlands State University on the global academic landscape. “I`m very happy because it shows that the university puts great emphasis on research. 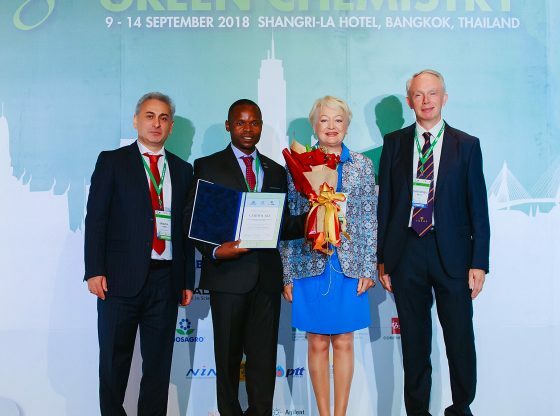 We normally struggle to get funding to carry out research on various issues so this award will allow me to carry out the research with my colleagues from Sweden and South Africa,” he said. The Executive Dean in the Faculty of Science and Technology, Dr Action Nechibvute commended Dr Mehlana for raising the university`s flag in the global academic arena. “I want to congratulate Dr Mehlana for winning such a prestigious award and as Faculty of Science & Technology, this shows we have what it takes to compete at the highest level in the world. As a Faculty, we thrive to be among the best in the world “in cutting edge research” that provides technological solutions to the challenges faced by the local industries,” he said. The project involves the synthesis of porous materials that will be used for capture and catalytic conversion of carbon dioxide to useful chemicals such as formic acid and methanol and is meant to address environmental concerns, scenarios inevitably more threatening to low and middle income countries. Furthermore, it will also provide organic starting materials for the chemical industry in countries devoid of fossil oil resources. Dr Mehlana is a recipient of other global accolades which include the African German Network of Excellent Sciences Award in 2015 as well as the International Centre for Diffraction Data Award in 2013. On behalf of the Midlands State University community, we would like to congratulate Dr Mehlana for this great achievement.